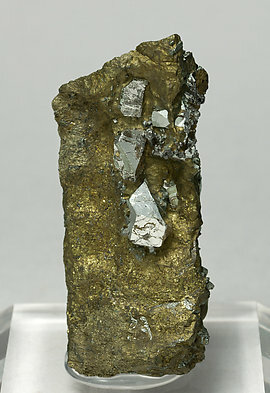 Cubo-octahedral Sperrylite crystals, a rare platinum arsenide much desired by collectors. 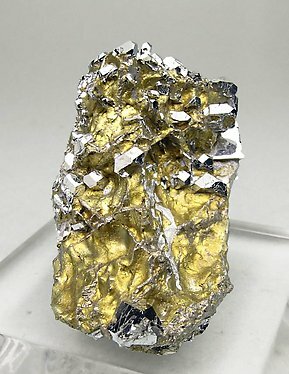 The crystals, that have the very well balanced faces of the cube and octahedron, are very well defined, extraordinarily bright, and on a Chalcopyrite matrix. Excellent group of very sharp, well defined and bright crystals of this rare species. The samples from Norilsk, some time ago more or less affordable, are actually very difficult to obtain now. 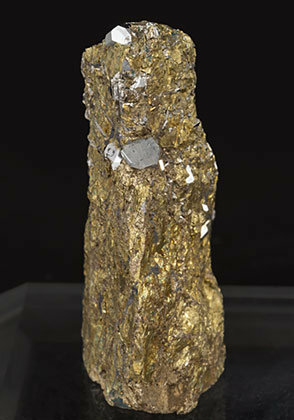 Magnificent cubo-octahedral Sperrylite crystals that are very sharp, elongated, with very well defined faces and edges and on a Chalcopyrite matrix. The sample is from the Michael Shannon collection, whose label we’ll send to the buyer.